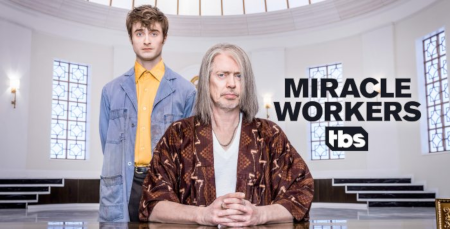 You are here: Home » GENRE » Fantasy » Miracle Workers (fantasy TV series: trailer). Miracle Workers (fantasy TV series: trailer). Miracle Workers is a new fantasy comedy TV series with some big names, launching February 12th 2019 on TBS in the States (it’s based based on Simon Rich’s book What in God’s Name). Think of it as a cross between The Office and The Good Life. Daniel Radcliffe (aka Harry Potter), Geraldine Viswanathan and Karan Soni play lowly angels stuck working in God’s 9-to-5 bureaucracy, while the always riveting Steve Buscemi plays a rather capricious God who wants to end the Earth and design restaurants instead. « Interstellar: special edition starring Elon Musk.